Why is Blue Bell Called Blue Bell? For over a hundred years, one company has dominated the market of one of the world’s favorite sweet treats. At the supermarket, millions of people reach for that same tried and true brand that never ceases to warm hearts despite its cool, sweet taste: Blue Bell. Blue Bell has been a staple in the ice cream world since 1907. The coveted brand got its start in Brenham, Texas. In this small Texas town, local farmers banded together to create a creamery plant to manufacturer butter which they fittingly named, Brenham Creamery Company. It wasn’t until four years later that the farmers began to make ice cream. In fact, it wasn’t until 1930, 23 years after its creation, that the company changed their name to Bluebell Creameries. The name change was led by new General Manager, E.F. Kruse, a previous school teacher, who was hired to reshape the floundering company in 1919. Today, the Kruse family still runs Bluebell Creameries, however it is now led by E.F.’s grandson, Paul Kruse. 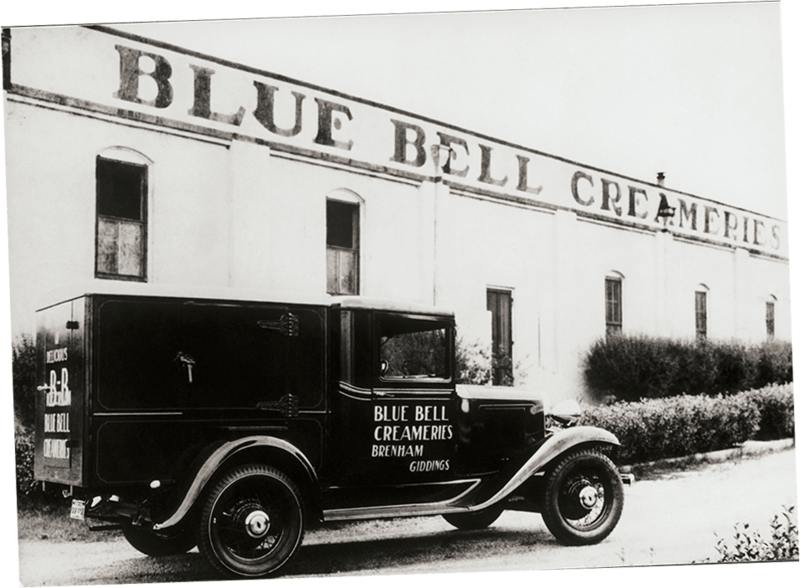 At the time, Bluebell Creameries operated through a single small building making ice cream, and delivering it to the town via horses and wagons with no idea what the future had in store. It’s crazy to think about, but the company started out only making about two gallons of ice cream per day. In order to keep up with growing demand, the company invested in equipment to scale their production capacity from two gallons a day, to 6,000 gallons per year! In 1993, the company was producing 15,000 gallons of their Homemade Vanilla per hour. Why is it Called Blue Bell? The big question can be answered very simply. E.F. Kruse decided to change the name of the company to Blue Bell after a native Texas wildflower. It seems as though Kruse thought, with the changes made to the company to encourage improvement, a name change was an important part of pushing the company forward and building a fresh brand reputation. The company did hit a few roadblocks along the way. For example, they had a really difficult time creating their Cookies ‘n’ Cream flavor. The production of flavor was tedious, employees had to peal open individual packages of Oreos to make the flavor. Eventually, like other innovated companies, they switched their approach and started making their own cookies to operate more efficiently. Additionally, the company had to remove products from the shelves due to listeria contamination and unsanitary conditions.